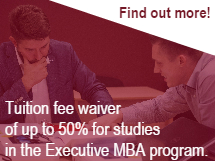 The Center for Competitiveness at Riga Business School is a platform for business leaders and managers to share ideas, research and information. We host conferences and seminars to facilitate this sharing when people who are part of the RBS or Riga community have new or important topics of interest or distinguished speakers visit Riga. We will collaborate with business partners like the American Chamber of Commerce in Latvia when providing these events. Most events are free of charge for AmCham members and RBS students and alumni. See the event calendar to register for upcoming events!